Referring Doctors LoginYou’ll be taken to our secure referral system. Why Us For Your Patients? Our practice is one of the first endodontic specialty practices in the U.S. to employ this new high resolution radiographic technology. The Kodak 9000 3D provides very detailed three-dimensional digital radiographs of the jaws to image areas of interest with greatly reduced radiation when compared to medium and full field of view CBCT units. 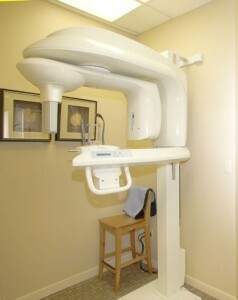 All radiographs in our office are taken with digital sensors. The image acquired is then sent to a computer and can be instantly viewed on monitors. These images require up to 90% less radiation than conventional dental x-rays. We use special operating microscopes during all phases of your endodontic treatment. Magnification and fiber optic illumination are helpful in aiding the doctor to see small details inside your tooth. In addition, a digital camera on the operating microscope can take images of your tooth to further document the doctor’s findings. The camera is mounted by the x-mount, a device that Dr. Herbranson developed. We utilize advanced electronic root-length measuring technology to insure accuracy of instrumentation. They reduce the need for mid-treatment x-rays. Dr. Jaber did his graduate research on these devices. These advanced devices use a quartz crystal to vibrate small instruments to help clean the canal and remove posts and other canal obstructions. Our handpieces control high tech nickel-titanium instruments with great precision. These units sense when torque (tightness) approaches pre-set levels, and they reverse rotation to adjust to these limits.